Just because someone’s wealthy doesn’t mean they’re a major donor. That’s why DonorSearch goes beyond the basics of prospect research by recommending prospects who are known for their philanthropy first and their wealth second. 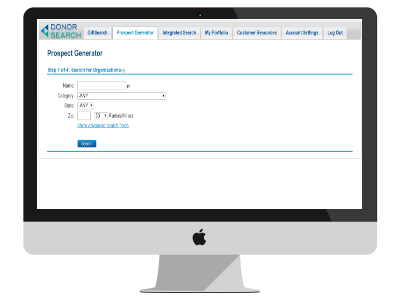 DonorSearch integrates with DonorPerfect, so you can pull donor records from your DonorPerfect system and screen them. All wealth and philanthropic data discovered by DonorSearch instantly flows back into your donor records in DonorPerfect. Screen any number of donors in a single batch with a unique 5-step process that does the work for you! Benefit from the ability to screen in batches and one-off records as needed when you bundle DonorSearch ProspectView Screening and ProspectView Online. Plus, you’ll save big on both!